The European DTH market may be poised for a significant shakeup in the coming months, following a proposed merger between three of the continent’s largest DTH platforms: British Sky Broadcasting (BSkyB), Sky Deutschland, and Sky Italia. NSR has noted in previous reports that the Western European DTH market could benefit from such consolidation; however, issues such as language barriers and subsequent difficulty in standardizing content has made such a proposition difficult. But, now due to a combination of factors (namely what appears to be a reasonable asking price for Sky Italia) there appears to be in the works the creation of a massive DTH platform in Western Europe, with the proposed merger creating a platform that would capture nearly 50% of all DTH subscribers in Western Europe by merging 3 of the 5 largest platforms into one. This merger could lead to substantial changes in the Western European DTH market, most notably increasing bargaining power for this colossal platform when dealing with content providers, for example, the larger football leagues in Europe. This content is generally one of the largest components of operating costs for these platforms—for example, in 2013, BSkyB invested over £2.5 billion, or roughly 1/3 of overall revenues, into on-screen content. Therefore, by leveraging a subscriber base of almost 20 million, even a cost savings on content of 10% would translate to several hundred million pounds to their bottom line. The merger would likely lead to other benefits for the platform as well. 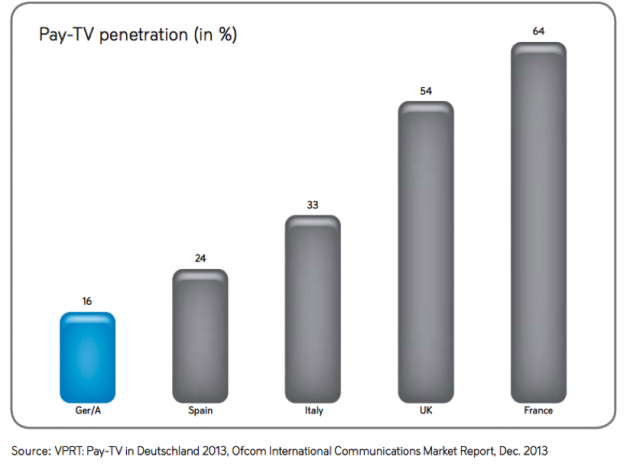 With a low Pay-TV penetration rate of ~16%, Germany/Austria is likely the market that stands to present the largest opportunities by virtue of lower costs to subscribers, better content through synergies between the three platforms, or a combination of both. DTH does have an excellent foothold in the country, with >50% market penetration among Pay TV households; however, with 84% of households still on free-to-air, this merger will likely spell opportunities for differentiation and a subsequent increase in the value proposition of the Sky Deutschland component of the company. If Sky Deutschland’s pay TV market share holds steady, and Pay TV penetration were to increase to 25% in Germany, this would translate to a subscriber boost of over 2 million subs, or an increase of over 50%. For years, the industry has discussed DirecTV and DISH Network in the U.S. as the two big players in the global DTH industry by customer numbers and revenues. However, it now appears that this duo will become a trifecta, with the proposed merger of BSkyB, Sky Deutschland, and Sky Italia creating a platform with 5% fewer subs than DirecTV, and 25% higher revenues than DISH Network. 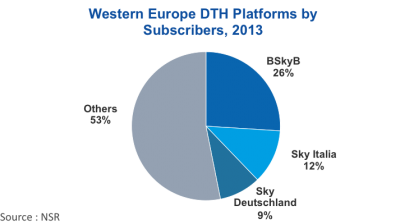 This new platform will transform the Western European DTH market, with the cost synergies, better content, and substantial market penetration helping to stem a stagnant economy and, if executed properly, provide significant subscriber boosts in a region that many have left as an afterthought when assessing the global DTH growth picture moving forward.